Naar-Phu. Photo courtesy of J Davies. Walking holidays have become increasingly popular as more people enjoy the health benefits that an active or adventure holiday can bring as well as the opportunity to take in new surroundings and stunning scenery. However the idea that a trekking holiday is only really suitable for experienced hikers is a myth. Anyone of any fitness level can take part in a walking tour, and there are many different styles of holiday that suit varying tastes, preferences, interest ranges and abilities, some being more challenging than others. Trekking tours are usually graded by level, so that a person can decide beforehand what pace of walk they want to take part in on holiday. This is also important because it helps to match the level of walking ability with the grade of walk so that someone does not find it too strenuous for the level. Gentle walks, for instance, may only last a few hours and are considered relatively easy. Most of these types of walks are at low altitude so that there are no strenuous hills and mountainous climbs to negotiate. These walks often combine a mixture of sight-seeing and treks and are often suitable for families. A trek of moderate grade will be more active and will usually involve hiking across mountain passes or remote parts of the country. Typically, this involves about a week of walking. A classic, vigorous trek is usually longer, often up to two weeks, and the scenery and terrain more varied. This is particularly suitable for mountain or hill aficionados. A strenuous trek can last even longer and normally involves travelling in regions away from civilisation. Walks may continue solidly for a number of days, with a rest breaks allotted. This type of tour is aimed at experienced mountain walkers. Walks are not just graded by level of difficulty. They are also defined by the type of scenery or terrain you might expect to encounter, such as woodland walks, mountainous treks, trails that pass along coastal paths or beaches or tours through jungle or the bush. Trekking tours do not also have to be about getting as far away from civilisation as possible. Many walking holidays feature guided group trails that take in cultural sites as well as the sights and sounds of towns and cities. Most hiking holidays feature a specific country, and particular sites are included during the trek. A trekking holiday in China might, for example, involve walking along part of the Great Wall of China. 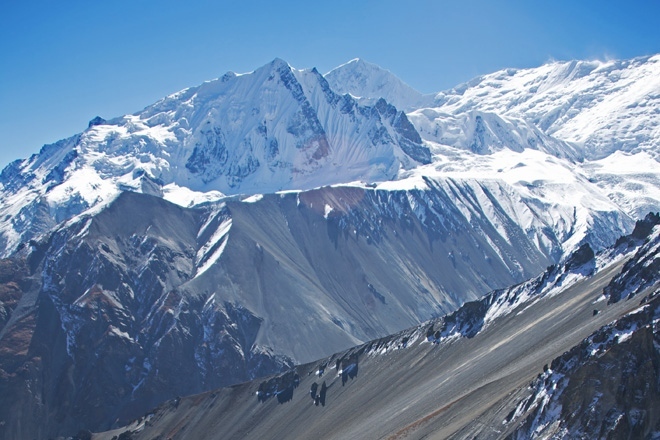 A trek might follow a famous route such as Peru's Inca Trail or Everest Base Camp. Hiking holidays do not just have to be centred on visiting famous beauty spots or landmarks. Many walks are designed to get off the beaten track and avoid tourist hubs and to experience trails that allow the walker a chance to get up close to the true identity of a place. This could be following paths through remote villages to gain an insight into how locals live, but it's also a chance to understand and appreciate the natural characteristics of an area. Some walking holidays are based around specific events or interests, so bird watchers and lovers of wildlife might opt to take a guided tour on a trail where animals and bird species have habitats, for instance. Other trekking tours may combine walks with cycling or skiing or travelling with organised transport from a walk in one area or country to another one. One other consideration that needs to be made before booking a walking holiday is to decide whether you want to arrange the holiday independently or go as part of an organised group. If you do it alone, then you will need to arrange travel and accommodation, as well as plan the walking routes yourself. If you go as part of an organised group through a specialist walking tour operator, then the travel and accommodation arrangements will be made for you, these walks will also usually be led by an experienced guide. The advantages of going on an organised group walk with a guide are numerous. The guide will have a good knowledge of the local area and the route, which means you are not likely to get lost along the way and also can feel safe in the knowledge that an expert understands the varying terrain and conditions. A guide can also divulge important or interesting facts en-route, such as the local flora and fauna, specific landmarks or even just hidden knowledge about a good place to stop and rest your legs for a while. Going in a group is also generally safer than walking on your own, and it gives you the opportunity to engage with like-minded people of similar abilities. If the walk involves stopping off at campsites or accommodation en-route, then having ready-made friends to share stories with in the evening makes for a more pleasant and sociable experience. Indeed, accompanied trekking is ideal for anyone who has never tried holidays of this nature before, or feels a bit uncomfortable about tackling it independently. Many people who might be considering active holidays such as trekking may worry that they need to buy expensive hiking equipment to take with them. This is not necessarily the case. If you go as part of a tour, then the guide or operator should be able to give you an idea of what you will need to bring with you. This may depend on the terrain and forecasted weather conditions, for instance. The most important item that you will need, no matter what grade of trek, will be a solid pair of comfortable walking boots. Waterproof, breathable clothing is also vital. As there are so many different things to think about when it comes to holidays that involve trekking, it is usually a good idea to get expert advice before booking your trip. When and where you want to go, what you want to see or achieve from the walk and grade of difficulty all need to considered. Please call or contact us for availability or for a brochure / more information on our worldwide holidays or check the website for details of all the countries we explore with our exciting holidays.